Description: Rainy. Here is an original telephoto view that I took of a Pennsylvania Railroad train at the Horseshoe Curve near Altoona, Pennsylvania, on 12 October 1965. Shown here (L to R) are PRR engines #8656, 8655, 2261, 2360, and 7186-B. #8656 and 8655 are AS-18AM's built by the American Locomotive Company in 1957 and rated at 1,800 horsepower each; they are serving as "helpers" in this context. #2261 and #2360 are EF-25's built by EMD and rated at 2,500 horsepower each; #2261 was built in 1964, but #2360 was built in 1965. #7186-B is an EFS-17M built by EMD in 1957 and rated at 1,750 horsepower. They are about to pass under four-track Signal Bridge #2417/2418 with a 99-car westbound mixed-cargo freight train and N-8 caboose #478151. Bringing-up the rear are "pushers" #6500 and #6306. Description: Rainy. Here is an original photo that I took of a Pennsylvania Railroad train at the Horseshoe Curve near Altoona, Pennsylvania, on 12 October 1965. Shown here (L to R) are PRR engines #8656, 8655, 2261, 2360, and 7186-B. #8656 and 8655 are AS-18AM's built by the American Locomotive Company in 1957 and rated at 1,800 horsepower each; they are serving as "helpers" in this context. #2261 and #2360 are EF-25's built by EMD and rated at 2,500 horsepower each; #2261 was built in 1964, but #2360 was built in 1965. #7186-B is an EFS-17M built by EMD in 1957 and rated at 1,750 horsepower. They are pulling a 99-car westbound mixed-cargo freight train around the Curve and up the Allegheny Mountains to Gallitzin and points West. The caboose is N-8 #478151. Bringing-up the rear are "pushers" #6500 and #6306. Description: Rainy. Here is an original photo that I took of Pennsylvania Railroad trains in Altoona, Pennsylvania, on 12 October 1965. Shown here (R to L) are PRR engines #8656, #8655, #5896, and #5716. #8656 and 8655 are AS-18AM's built by the American Locomotive Company in 1957 and rated at 1,800 horsepower each; they are serving as "helpers" in this context. #5896 and #5716 are EP-22's built by EMD and rated at 2,250 horsepower each; #5896 was built in 1951, but #5716 was build in 1952. They are pulling a 17-car westbound passenger train up the Allegheny Mountains via the Horseshoe Curve to Pittsburgh and points West. Also visible are numerous "Ore Jennies" in a westbound iron-ore train and several buildings of the PRR's 12th Street Shops. This photo taken from the steps along side of the 17th Street Bridge. Description: Mid-Mountain. 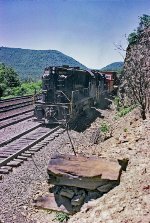 Here is an original photo that I took of a Pennsylvania Railroad train West of Altoona, Pennsylvania, during mid-June of 1966. Shown here (L to R) are PRR engine 8655 and another unit whose number was not recorded. Both were built by the American Locomotive Company. #8655 was built in 1957 and rated at 1,800 horsepower. They are pushing a westbound TrucTrain up the Allegheny Mountains, but will uncouple at Gallitzin and return to East Altoona for yet another run up the Mountains. The slope of the Horseshoe Curve's upper end is also visible in the distance.